Slugs are sometimes referred to as naked snails. Slugs are 3/4 of an inch to sometimes over 6 inches long and range in color from light yellow, brown, lavender, to purple. Slugs require moisture to move around. They release a slimy mucus substance, which they use to move. The mucus dries into a shiny noticeable trail. Slugs are nocturnal because the humidity at night is high from evening rains or irrigation. 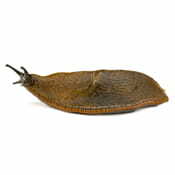 Slugs hide in the day light under weeds, plant debris, mulch, boards, rocks, and ground covers. Moisture creates an increase in slug population. Slugs feed on plants including annuals, perennials, bulbs, ground covers, trees, and shrubs. Slugs can eat seedlings, herbaceous plants, and fruit lying on the ground. Slugs have a strong sense of smell and they will travel long distances to locate a food source. Chuck Sullivan Exterminators knows how to quickly and effectively get rid of slug infestations in your home, yard or commercial property, guaranteed. Contact us to schedule an appointment today for getting rid of slugs in your home or garden. Chuck Sullivan Exterminators provides an All Pest Service Guarantee so you won’t have to worry about slugs in your home or commercial building after treatment has been applied. *Slugs are covered to 10ft out away from home as part of the All Pest Service. Treatments beyond that can be included ask your technician about pricing.